It’s bold, it’s fierce, it’s a must for rock stars of any gender persuasion. I’m talking about eyeliner – a dark streak of color around your eyes is the sure fire way to make your look pop and express that personality. There are some celebs who get it right every time and have a strong eyeliner game. I’ve been looking at the best to learn tips that work for every day glamour. Here are the best ways to get the look yourself, from the celebrity tips and websites that inspired me to amp up my eyeliner game. – Start with the bottom. Most really bold eyeliner looks begin with lining the bottom lashline — it’s a method you have to practice and perfect on your own. Keep your liner sharpened and clean, and practice lining that bottom waterline until it’s like second nature. Soon enough, it will be. – You’re gonna need either liquid liner or gel. Some people layer their liquid or gel liner over eyeliner pencil. Some use the liquid or gel as a base and layer powder eye shadow after that. Mila Kunis’ makeup artist, Tracy Levy, makes that her method. According to this Nylon interview, she uses MAC Fluidline Eye Liner Gel in Blacktrack or Bobbi Brown’s gel liner. “Put on with a tiny little thin brush and you have to blend it. While it’s still wet you work from the inside out, and you blend it with a brush, and that’s how you’re smoking it out. If you need to clean up so it goes up a little bit more [like a cat-eye], you can do that, but it’s totally smoked out once you smudge it. You put powder on top of it…the gel liner is essentially like a primer. You smudge it out while it’s still wet. It’s going to last until she washes it off. Putting a little bit of powder on it makes it smoky.” I love Mila’s eye makeup – good to know! — For a really clean and precise cat eye, use gel or liquid liner over pencil, OR use a felt eyeliner. My current quick cat eye method comes via Buzzfeed — click that link for great eye makeup tips! 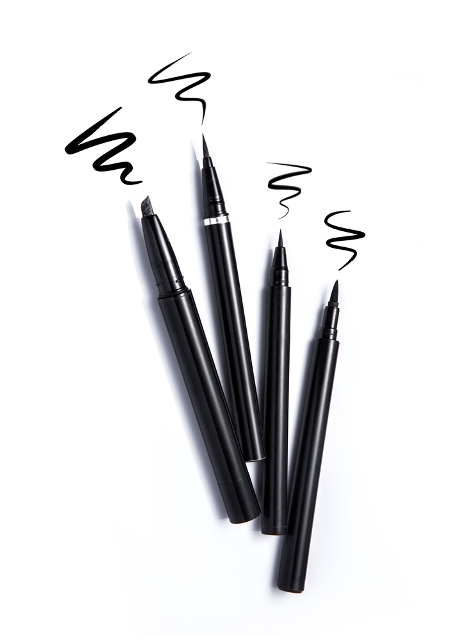 I use a regular eye liner along my top waterline and then trace along it with a liquid or gel. My latest gel liner fave is by Urban Decay — that Super-Saturated Ultra Intense Waterproof Cream Liner is no joke! There are some hot new liquid liners out there that make application way easier — I’m BIG into Lancome Artliner , which comes in fierce colors like gold and amethyst. For easy breezy application, check out Benefit’s They’re Real Push Up Eyeliner, which is gel liner in pen form. — Set with powder and smudge for your life! 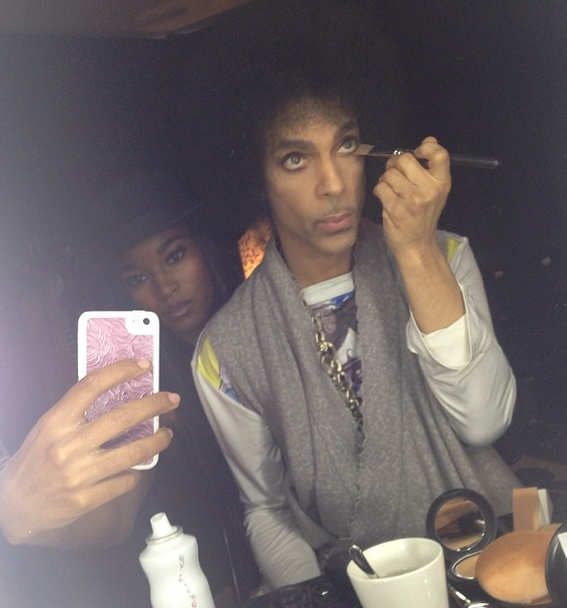 Do you see Prince in this photo (which was shared via Instagram) using a flat brush like a BOSS to smudge his eyeliner to perfection? YES. That’s how to make your makeup last! Most celebrities set their eyeliner with a black powder eye shadow, especially if they’re going to be out all night under hot lights. Use a flat or angled brush and pack that black powder on. Watch out for fallout! That’s why Shadow Shields were invented. — Tightlining will take your look to the next level. I can’t say that I’ve mastered the technique, but this gif-heavy post via The Cut helps to break it on down. When it’s done right, you won’t really even look like you’re wearing eyeliner at all – your lashline will just look full and fabulous. There are SO many ways to enhance your eyes! — Your clean-up crew includes Q-tips, concealer, blot powder and a wedge sponge. OK, so you may not achieve the perfect flick or the neatest line on your first attempt. That’s what your cleanup crew is for. I asked my friend, celebrity makeup artist Tia Dantzler for her best eyeliner tips. She came through in the clutch! “Because of the season we’re in you want to shop for an eyeliner that’s both smudge-proof and water-proof to avoid raccoon eyes. Another great tip is to seal the liner with a matching eye shadow for staying power. Just to stay on the safe side I also like to apply blot powder really close to the lash line with a wedge sponge for added security.” Note to self — get up on this blot powder game. With these eyeliner tips, my cat eye skills are about to be SICK! It’s just a matter of practicing for precision. What are your best eyeliner tips? Prince is SO fly!! I keep forgetting to use eye shadow to make the liner smudge proof under my eyes. Great, great, great!!! 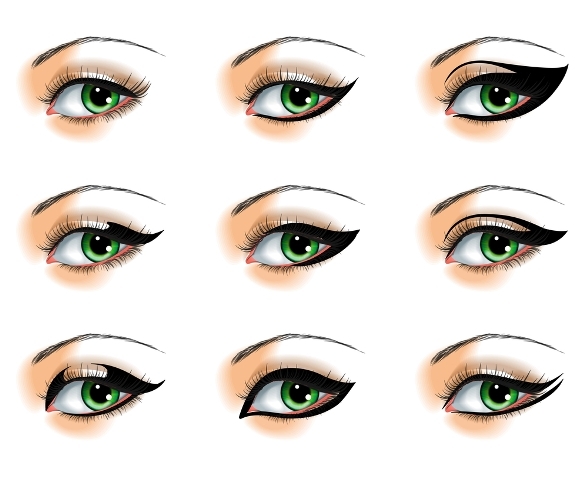 I love eyeliner, and love all the different ways you have listed and shown how to apply. Prince/Purple Rain/The Artist def knows what he is doing with that flat brush! Great tips, thank you!